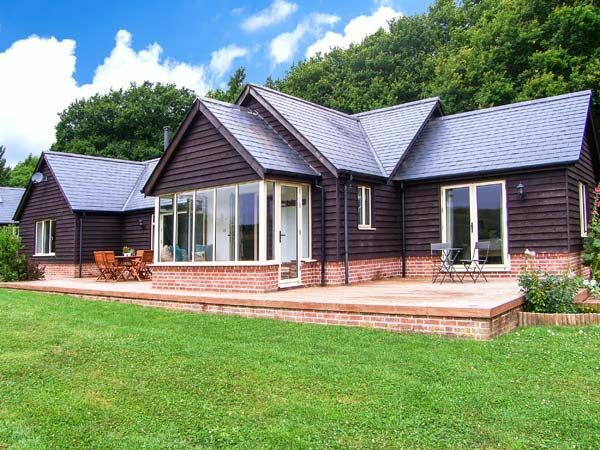 A fabulous, single-storey cottage set within a 2000-acre woodland nature reserve near Farley, Wiltshire, with three bedrooms accommodating six people. Amenities: Oil central heating with woodburning stove. Electric oven, induction hob, microwave, fridge/freezer, washing machine, tumble dryer, dishwasher, 2 x TVs with Freeview, DVD, WiFi, selection of books and games. Fuel, power and starter pack for stove inc. in rent. Bed linen and towels inc. in rent. Off road parking for 3 cars. Undercover bike storage. Enclosed lawned garden with two decked patios and furniture. Use of on-site boules court with boules provided. Two well-behaved dogs welcome. Sorry, no smoking. Shop 3 miles, pub 1 mile. Note: There are beef cattle, sheep, horses and llamas in the adjacent fields, therefore dogs should be kept on a lead when in the garden. Note: The property is accessed through woods via an unmade and uneven track, 0.4 miles long, not suitable for low wheelbase cars. Note: Mobile phone signals can be intermittent. Town: Bentley Woods is a 2000-acre woodland nature reserve, designated a Site of Special Scientific Interest. It sits on the Wiltshire side of the border with Hampshire and is possibly one of the largest areas of woodland in the county. Unspoilt and protected, the woods have many clearings where all kinds of wildlife, notably butterflies, can be frequently viewed. There are wonderful walks locally and if youre lucky, you might chance upon some of the deer who roam the beautiful woodland glades. All ground floor. Three bedrooms: 1 x king-size double with en-suite walk-in shower, basin and WC and doors to decked patio, 1 x double, 1 x twin. Bathroom with bath, hand-held shower, basin and WC. Kitchen with dining area. Utility. Sitting room with woodburning stove. Study.